From the April issue of Orthodontic Update we want to encourage subscribers to participate in our ECPD programme online. Abstract: Loss of periodontal attachment in adults usually manifests as pathological migration, traumatic deep bite and irregular dental spacing, which lead to compromised aesthetics and function. This article describes the interdisciplinary management of an adult patient presenting with severe periodontitis accompanied by marginal bone loss and pathological migration of the upper right anterior teeth. The combination of a modified intrusion procedure of the upper anterior teeth and periodontal therapy led to significant improvement in function and aesthetics. 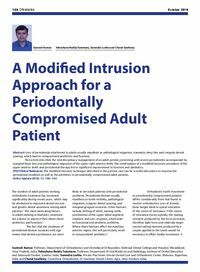 Clinical relevance: The modified intrusion technique described in the present case can be a useful alternative to improve the periodontal condition as well as the aesthetics in periodontally compromised adult patients. Author notes: Santosh Kumar, Professor, Department of Orthodontics and Dentofacial Orthopedics, Kothiwal Dental College and Hospital, Moradabad, Uttar Pradesh, India, Yehoshuva Reddy Tummuru, Professor, Department of Oral Medicine and Radiology, Institute of Dental Education and Advanced Studies, Gwalior, India, Surendra Lodha, Private Practioner, Umrao Dental Care and Orthodontic Center, Bhilwara, Rajasthan, India and Chand Sawhney, Consultant Orthodontist, Dr Sawhney Dental Center, Agra, Uttar Pradesh, India. Objective: To explain that there is no contra-indication to treating adults who have periodontal disease as long as the disease has been brought under control and plays a major part in the planning and execution of orthodontic treatment for all adults. © 2008-2019 George Warman Publications (UK) Ltd. All rights reserved.